Our Roots. It all began in Denmark just after the war. Karl Kroyer had invented a continuous method for hydrolysis of starch into glucose. 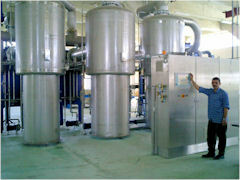 More than 200 licensed factories were build all over the world. Karl Kroyers organization did not sleep on the laurels. The invention was further developed as effective enzymes emerged. It was possible to drive the enzymatic hydrolysis of starch so far and so perfect that the hydrolyzate consists of almost pure dextrose. New enzymes can convert dextrose to fructose and hence the same chemical composition as in the familiar table sugar can be obtained. 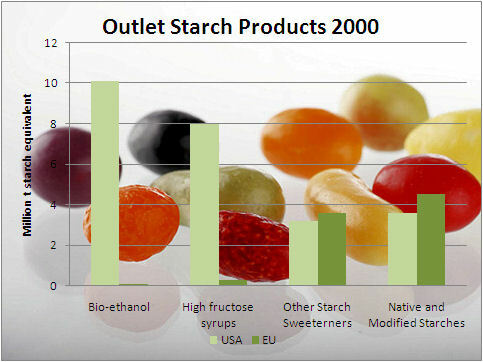 This has really increased the spectrum of sweeteners and down-stream products derived from starch. Where do we go. Evolution did not stop there. The new sweeteners are perfect raw materials for various fermentation products, whether it concerns the well-known flavor enhancer monosodium glutaminate MSG , The Third Spice, or fermented into vital L-lysine for animal feed or just beer. 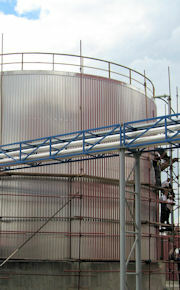 International Starch Institute has been involved throughout. Not only have we refined the original Karl Kroyer process, but today we offer complete turnkey plants for the manufacture of all types of starch-based sweeteners and all the down-stream products derived therefrom ... and we are not confined to Denmark or Europe, we supply our factories worldwide. Starch Sweeteners a giant market. Sweeternes is the largest outlet for starch. In the USA starch sweeteners in the form of High Fructose Syrup has replaced the traditional cane sugar and the same trend can be seen everywhere in the world. Starch of any origin can be transformed into the classic 42 DE syrup for sweets, into high maltose syrup for beer, into high fructose syrup for soft drinks and as an industrial substitute for cane and beet sugar in general. Technical Memorandum on Glucose The Second World War caused a shortage of sweeteners which brought about a new leap ahead with the invention of the continuos glucose converter by Karl Kroyer, Denmark. Members of The International Starch Group were deeply involved in inventions and development. Karl Kroyer invented several advanced processes for the conversion of starch into glucose and other downstream products.